We’re happy to announce that The Messages Project has been accepted as a recipient of a grant from the 2013 Deep Run High School Marathon Dance (DRMD)! Students in Virginia will dance for 27 hours on March 15-16 to raise funds for local non-profits such as ours. Last year, the dance raised $250,000 for 12 charities. Their goal this year is $1 million! The grant we receive will allow us to buy new cameras for our program and pay for postage and DVD costs. 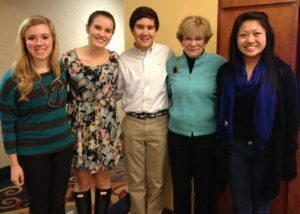 Messages Project Founder Carolyn LeCroy had the opportunity to meet with several of the teens involved with the upcoming Deep Run Marathon Dance in Virginia. These wonderful students are part of the reason our program was chosen (out of about 70) to receive grants from their fundraisers this year. Click here for a complete list of upcoming events and address information. If you don’t live in the area and would like to support, you still can! The DRMD offers an Online Donation Form for anyone who would like to contribute to the cause. Please donate if you can. Let’s help the dance reach its $1 million goal!